Tangled and True: thank you. I want my kids to each have their own personalized stationary. That way Thank You's and notes are quick and easy. 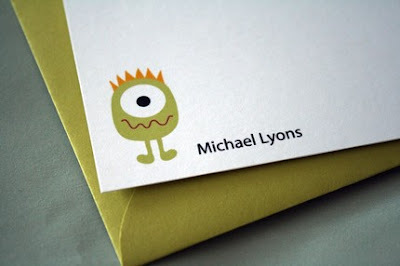 I like the monster for Finn (not that he can write yet..but I could stamp his thumb print or something). How do your kids say Thank You? My girls have personalized cards given to us by a sweet blog reader who has an Etsy shop. I think it's important for kids to be taught that a handwritten Thank you is still good to do. love the idea of a finger print for the little ones who can't write yet...so clever! I love to take a picture of them with whatever they received (be it a book, gift card, etc.). I paste that to a plain piece of cardstock and let the boys write a note or sign there name. Simple, but I love doing that! I print off a coloring page of the received gift and let my toddler color it and "sign" it, I jot down a thank you quote from him and send it in the mail. What a wonderful idea. So great that you are teaching you kids to be polite! I have not children, just teach them everyday. diy card and some WINNERS!